What's in the Water II? Ever wonder what happens to all that stuff that goes down the drain? 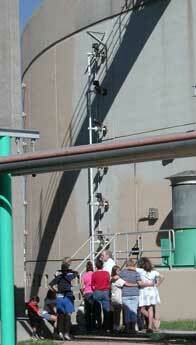 On October 11, 2003 , a group of Coati Kids and parents visited one of Tucson 's very own sewage treatment facilities. (The Coati Club won the tour as a prize in the Earth Day Parade last year.) Here is what they discovered! Eric Nixon of the Pima County Wastewater Treatment Facility on West Roger Road took us on our tour. He told us that this facility treats water for 400,000 people in Tucson . Every time water flushes down a toilet, sink or shower, or rushes down a storm drain in the city, it comes here. The plant treats 40 million gallons of water a day! Sewage starts here, at the Primary Clarifier. It comes into big tanks. Heavier solids like paper and human waste drop to the bottom. Water from the top goes on to the Biotowers. The Biotowers are tall tanks full of bacteria. The water is sent to the tops of the Biotowers and slowly trickles down through the bacteria. The bacteria "eats" the impurities in the water. When the water reaches the bottom 6 hours later, it is much cleaner. It then goes on to a Secondary Clarifier. In the Secondary Clarifier, more solids settle out. 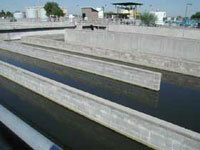 The solids from both clarifiers go to Digesters where more bacteria break them down. The bacteria release methane gas. The treatment plant uses this gas to generate its own power. The solids that remain are gathered and used as fertilizer on cotton fields. The water now smells earthy, like a stream in the woods. The last step is to disinfect it. The treatment plant uses strong chlorine bleach to do this. They use about one half of one of these large, blue chlorine tanks a day. The water enters a disinfecting tank with many s-shaped curves. The chlorine is added at the upper part of the tank. The water travels slowly through the s-curves. This lets the bleach mix in completely. After an hour, the water leaves the chlorinating tank. The water is now disinfected, so the extra chlorine is removed. This makes the water safe to put back into the environment. Some of the water is pumped back to the treatment facility to cool machinery and water lawns. The City takes some of it to water golf courses and parks. We call this "reclaimed water." But most of it goes into the Santa Cruz River . There, the water creates habitat for trees, birds, aquatic insects, and many other animals. 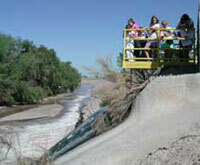 It also trickles down through the sand and gravel where it adds to our precious groundwater. From there it will be pumped up and used by people in Tucson all over again! We were impressed. So much of what cleans the water is natural - bacteria - and not all chemicals. We discovered how all that waste turns into riches - water for people, other animals, and plants. After our tour, we went to Sweetwater Wetlands, a nearby park. The park has lakes full of birds, turtles, and other wildlife. The lake water is reclaimed water from the nearby sewage treatment facility! What a great use of sewage, eh?